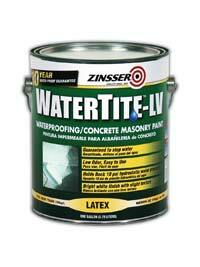 WaterTite-LV waterproofing, low-VOC latex-base paint is formulated for application on interior and exterior concrete block, cast concrete, stucco and other masonry. It combines a waterproofing resin with micro-spheres to form an impermeable barrier that stops 12 pounds of hydrostatic pressure. It is effective at weatherproofing interior concrete and masonry surfaces, as well as retaining walls and other exterior concrete and masonry structures. Available 1- and 3-gallon pails, it has a slightly textured white finish that fills the micro-cracks and voids common to stucco, cast-concrete, and concrete block in a single coat. Users can apply it as a primer or paint in one coat or as a waterproofer or weather-proofer in two coats. Users can tint the paint to match most off-white or pastel colors.